ASK KATE OWEN TO DESCRIBE HER WORK AND SHE'LL MORE THAN LIKELY SAY THAT IT'S PUNCHY. IN FACT, THIS HAPPENS SO MUCH THAT HER COLLABORATOR SAM SHANNON DECIDED TO MAKE IT OFFICIAL - JUST LOOK AT THE WRITING ON THE WALL! Accompanying the many anecdotal neon signs you'll find throughout Kate and Sam's dual home/work studio, the space boasts an assortment of fun (or more appropriately punchy) items. Come to think of it, many of these objects are reminiscent of elements seen in their work as they are bold, fun, and full of life. These distinct qualities are the reason why we've come to love Kate and Sam's work so much. We've been lucky to call them our collaborators, and it's been inspiring to witness their fun and fearless approach in shooting our campaigns here at Brand Assembly. So to mix things up we decided to turn the lens around on them. We recently visited the duo at their Brooklyn studio to chat more about their process, and their tips for emerging designers who are looking to tell their brand's story through compelling visuals. Check out the full conversation below and visit The Style Line for an exclusive second part of this interview. Kate: Hey there! I’m Kate and this is Sam. I am a photographer and Sam is a director. Our work is what we enjoy. We love shooting films and taking pictures. We’ve been doing some really cool collaborations lately that we’re really excited about. WALK US THROUGH THE PROCESS OF SHAPING THE MOST RECENT BRAND ASSEMBLY CAMPAIGN. BETWEEN YOUR TWO AREAS OF EXPERTISE HOW HAVE YOU MANAGED TO BRING TOGETHER YOUR RESPECTIVE ARTISTIC VISIONS? Sam: Kate and I collaborate together a lot, and what makes our collaborations so successful is that we bring two different skill sets to the table (photography and film). For our latest Brand Assembly campaign we chose a medium that really united both of our interests in a way that both complemented and transformed the original material. AS PHOTOGRAPHERS AND DIRECTORS, WHAT INSPIRES YOU THE MOST ABOUT CREATING A FASHION-FOCUSED NARRATIVE? Kate and Sam: Our inspiration doesn’t always come from photos or film. We draw a lot of inspiration from painters, architecture, food, landscapes, fashion - really all over the place. A lot of the time, we find it more helpful to use abstract inspiration to create the most original work we can. WHAT EXCITES YOU THE MOST ABOUT CONTEMPORARY FASHION DESIGNERS AND DID YOU DISCOVER ANY NEW DESIGNERS WHILE WORKING ON THESE SHOOTS? 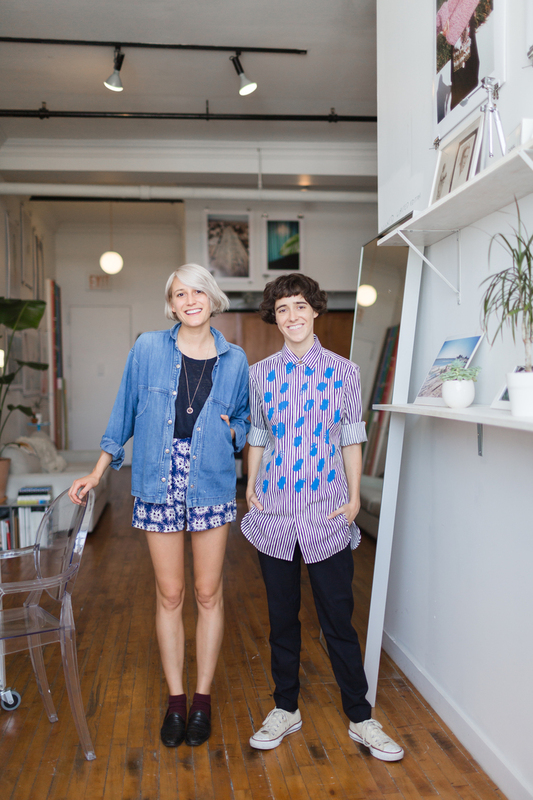 Kate and Sam: It’s exciting to see Brand Assembly working with designers that share our sense of style and passion. Brand Assembly has been amazing about giving us full creative control, which is a very unique experience. We really appreciate the leeway and the trust. WHAT ADVICE OR TIPS CAN YOU OFFER TO EMERGING DESIGNERS AND FASHION COMPANIES WHO ARE LOOKING TO EFFECTIVELY BUILD A VISUAL STORY AROUND THEIR COLLECTIONS? Kate and Sam: Social is really one of the most important platforms that designers can utilize to announce and build their brand. A strong visual profile can do incredible things for new designers. It’s not only accessible (both financially and media-wise), but has the ability to reach huge audiences. Kate and Sam: We’re always trying to be better, cooler, more exciting. You have to challenge yourself every day. You should never be repeating the same thing. You need to have a strong brand, but it should never feel stagnant!